For keen followers of US politics – and the very many beyond – yesterday’s mid-term elections provided the expected spills and thrills as the results flowed in from east to west. There was a general expectation that the outcome would produce a decent split between a House of Representatives reclaimed by the Democrats and a consolidated Republican Senate. After a wobble before 2am GMT where the House of Representatives looked close based on the earliest results, the Democrats pulled off a result that largely met expectations. 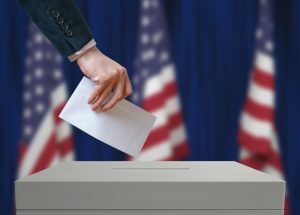 The mid-terms represent the first US-wide elections since the surprise election victory of 2016 when Donald Trump not only assumed the Presidency, but Republicans claimed both branches of Congress. While it was not precisely the kind of ‘shellacking’ bemoaned by Obama in the 2010 midterm when he lost 63 seats in a Republican wave, the Democrats gain of approximately 34 seats (they needed 23 to ensure a majority) still easily deserves the same ‘wave’ moniker and all the connotations it comes with. The 7% popular margin that the Democrats are estimated to have won with compares very favourably to other ‘Blue wave’-like elections, including 2014 (5.7%), 2010 (6.8%) and 2006 (9.0%). As such the Democratic take-back of the House of Representatives has dealt Trump a clear message from suburban U.S. voters in particular that they are displeased with the ‘toxic rhetoric’ that has characterized Trump’s governing ethos in the past 2 years, and which reached objectionable new heights during the final days of mid-term campaigning. In scooping up these 34 seats, Democrats appear to have been lifted by backlashes in suburban congressional districts, which contain voters who have largely swung back against Trump and the Republican Party from the original 2016 figures. Indeed, Democrats performed best in districts carried by Mitt Romney in 2012, and Clinton in 2016. A good example of this is the surprise Democrat win in Oklahoma’s 5th district, which registers as 13.5% above the national average in terms of its Republican affiliation, but is also dominated by urban and suburban Oklahoma City, where a range of very different viewpoints helped dilute the overall Trump message. This particular win means that victor Kendra Horn will represent the area as a Democrat for the first time in 44 years. Another seat representative of this same trend is Texas’ 7th district, which voted for Romney by a whopping 21.3% in 2012 but swung dramatically towards Hilary Clinton in 2016, who won it by a mere 1.4%. This year, Democrat Lizzie Pannill Fletcher took the seat from incumbent Republican John Culberson by around 4.7%, which means that the seat has swung even further since 2016. Representing wealthy suburbs near Houston, this seat is something a microcosm of the seats where Democrats did best nationally. House dynamics for the lower chamber look set to provide some drama. Early this morning, Trump rang Nancy Pelosi, the House Minority Leader to concede defeat. After eight years in the minority wilderness, Pelosi is now a strong bet to reclaim the speaker’s chair, which makes her the single most powerful Democrat in the US, at least until a viable presidential candidate is chosen. What Pelosi chooses to do with this power is key. Can she steer through a batch of new legislation? Or is she destined to be the figurehead of Democrat-instigated gridlock in a Democrat-controlled House, attempting to withstand “the growing pressure on her to step aside for a new generation of Dems”? The House election was also characterised by the sheer variety of candidates, most notably female representation in Congress, which looks set to reach a record high. This is a trend primarily driven by the Democrats, who fielded more female candidates for congress than any other party has before. The 2018 mid-terms also heralded other exciting female firsts, with Sharice Davids in Kansas’ 3rd district beating the Republican incumbent, to become the first Native American woman in Congress. To this we can add Rashida Tlaib and Ilhan Omar, whose victories in solid Democratic seats are truly ground-breaking, as the first Muslim women in the House of Representatives. US veterans are also likely to do well in the House, with a number of Democratic vets successfully challenging Republican incumbents in seats such as Jason Crow in Colorado’s 6th district, as well as Mikie Sherill in New Jersey’s 11th district, Mike Rose in New York’s 11th district and Elaine Luria in Virginia’s 2nd district. While this representation is very different from 1971, when 73% of Congress was veterans, it is an upswing since 2017, when it was just under 19%. On balance, the image of a Trump bloodied at the ballot box hasn’t precisely come to pass. The anticipated “blue wave” of Democrat support was simply not strong enough to erode key states in Senatorial or Gubernatorial areas, particularly in rural areas, as well as the crucial swing state of Florida. The result is that Republicans have retained control of the Senate. The outcome is nowhere near the blustering assertion by Trump that the entire outcome has been a “tremendous success” for his party (you’d expect him to say that, wouldn’t you), but there is a good chance of tremendous ideological impasses that could gum up American governance between 2018-2020. The US Senate meanwhile represents a terrain in which the average battleground state was 16% more Republican than the US as whole, and unsurprisingly saw incumbent Democratic Senators in red states like North Dakota, Missouri, and Indiana ultimately swamped by basic partisanship. While some Democrats hoped that the moderate stances of these incumbents would ultimately go their way, what carried the day were the substantial margins in races which that were predicted to be far closer. Of the states carried by Trump in 2016 by double-digits (North Dakota, Missouri, Indiana, West Virginia, Montana), only Senator Joe Manchin in West Virginia and Jon Tester in Montana bucked the trend and held on; arguably testament to the strong personal brand of each candidate and their mastery of retail politics in what are relatively small states. Democrats will also be bitterly disappointed with the loss of their Senate seat in Florida by the narrowest of narrow margins, along with their probable loss in Florida’s Governor race. Both results highlight clear Democratic underperformance in the Southeast, leaving Floridian Democrats scratching their heads wondering what went wrong.1 Interestingly, the one area where a clear return to base partisanship in the Senate has worked in the Democrat’s favour is Nevada, where challenger Jacky Rosen has beaten incumbent Republican Senator Dean Heller by wider margins than the polls had suggested in the only state with a Republican running for reelection in a state that Hilary Clinton won in 2016. Meanwhile Arizona’s Senate race is also proving to be a close run thing with Republican candidate Martha McSally still slightly ahead of Democrat Kyrsten Sinema. All in all, Republicans look likely to extend expand on the current 51 Republican, 49 Democrat split in the Senate by around three seats, which is arguably near the higher end of their predictions, but within the bounds of what was expected. In terms of trends, Democrats’ concentration of support in larger US states is becoming a key structural issue regarding their chances in the Senate, a pattern reinforced once again by these mid-terms. We need to bear in mind that while Donald Trump lost the popular vote in 2016, he won 30 states representing 60 seats in the US Senate. This kind of structural challenge is likely to provoke deep concerns among the Democrats regarding their future chances of achieving a Senate majority in the near future. Of special note are the results from Texas, where charismatic Democrat Beto O’Rourke ran incumbent Ted Cruz in a surprisingly close race, with Cruz only winning by less than 3% (he won in 2012 by 16%) in what amounted to the most expensive Senate race in US history. Despite the outcome, O’Rourke’s narrow margin will give Democrats hope that Texas might at some stage be added to a future ‘blue splash’, with party members suggesting O’Rourke as a presidential contender for 2020. At the gubernatorial level, Democrat expectations of a strong showing where largely borne out. Democrats successfully took Illinois, New Mexico, Michigan, Maine, Nevada, Wisconsin and Kansas out of Republican hands. By taking Wisconsin from Governor Scott Walker, Democrat candidate Tony Evers finally achieved what the party had been seeking to do in 2014 and in 2012, when Scott Walker won a rancorous recall election after being elected in the Republican wave of 2010. Meanwhile in Kansas, Democrats scored a real upset by handily beating Trumpian Republican Kris Kobach (who had beaten the incumbent Republican governor in the primary) by over 5%, in a state that Trump had carried by a whopping 20% in 2016. Democrats’ losses elsewhere proved sobering, including Ohio, Georgia and Florida, all of which were considered to be tight races. Democrats had high hopes in particular for Stacy Abrams in Georgia and Andrew Gillum in Florida, to whom recent polls had given a lead. With Ohio and Florida reinforced as 2020 key swing states, Democrats will be disappointed they could not bolster their chances by having incumbent Democratic governors helping drive those states. Clearly, a Democrat-controlled House has the opportunity to cause major problems for Trump during the final two years of his term as president. This can take a number of forms: first, in general by blocking his legislative plans; second, and more specifically, by dominating key House committees from January onwards to redress legislative decisions in the previous two years, or refashioning policy ambitions between now and 2020; third, both ad hoc and Committee-based requests that are not primarily policy-specific, but aimed at either impeaching Trump, or making his final 24 months in office as uncomfortable as possible (e.g. using subpoenas to request the president’s unpublished tax returns, to insist on a more robust inquiry into Trump’s links with Russia, or any form of behavior deemed to be ultimately unconstitutional. More broadly, for America as a whole, the results suggests yet more partisanship in Congress as a whole, and ongoing levels of social acrimony, particularly in closely-fought battleground states. Jody Avirgan from Nate Silver’s prediction website FiveThirtyEight for instance argued that “the election is reflecting just how divided we are — urban, rural, rich, poor, different education levels. That gulf continues to grow”. The key themes are ugly ones: anti-migration, anti-immigration, racism, sexism, corporatism, and even unconstitutional options all vie as leitmotifs capable of being boiled down into the reductivist idiocy that passes for Trump’s tantrum tweets. Any and all of these agendas were ushered into DC in 2016 and they have had precious little opposition from members of both houses. Failing to repudiate these narratives may seem a clever strategy helping to speed the Democratic Party’s suburban ambitions across America for the 2020 campaign, but they represent a dangerous blend of toxic populism that operates as blind nationalism at best and deliberate fascism at worst. Despite their Republican leaning, Idaho, Nebraska and Utah all voted to expand Medicaid access (US Federal health insurance), created by the Affordable Care Act, a.k.a. Obamacare. In a surprise turn of events, Democrats took South Carolina’s 1st district from the Republicans: a seat 10% more Republican than the US as a whole. Incumbent representative Mark Sanford, who had been somewhat critical of President Trump, lost his primary to Trump-backed candidate Katie Arrington, making this loss something of a Republican own-goal. In California’s Orange County-based 48th district, incumbent Republican Dana Rohrabacher lost his seat to Democrat Harley Rouda. Rohrabacher is notable for his strongly pro-Russian views, and referred to in some quarters as “Putin’s favourite congressman”. Thanks to Max Rose’s upset victory in the pro-Trumpy Staten Island district of New York 11, Democrats now hold every single house district in New York City. The three states that lifted Trump to the Presidency in 2016 (Pennsylvania, Wisconsin and Michigan), all have swung back and voted for both Democratic Senators and Governors this year. While West Virginia voted for Donald Trump in 2016 by a huge margin of over 40% in 2016 (making it the second most Republican state in the US) popular Democratic incumbent Senator Joe Manchin still managed to win his race by defeating his Republican opponent 49.5% to 46.3%. 1 Caveat Emptor: Due to the thin margins, as of late Wednesday, 7 November 2018, incumbent Democrat Bill Nelson has announced his campaign will request a recount. This is likely to be granted; it is however unlikely that the recount could swing the race by the required 35,000 votes. Horizon 2020: EU investment offensive or offensive investment? Published on 12 May 2015 by Amelia Hadfield | Comments Off on Horizon 2020: EU investment offensive or offensive investment? A Jet-Lagged Legacy? Or Unspoken Foreign Policy Spectrum? Professor Amelia Hadfield is Chair in European and International Relations and Jean Monnet Chair of European Foreign Affairs in the Politics/IR Team, as well as the Director of the Centre for European Studies (CEFEUS) at Canterbury Christ Church University. Amelia combines research, teaching, consultancy and doctoral supervision on key aspects of European foreign affairs.